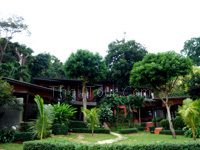 Samed Club - Koh Samed: Offers an affordable and comfortable retreat on the lovely fine sands of Noi Na beach with great views north across the sea to the mainland. With very few people on the beach in this northern part of Samed Island, Samed Club offers the right balance between self contained privacy and proximity to Sai Kaew beach and Na Dan village should you want to explore restaurants, bars and tour shops. 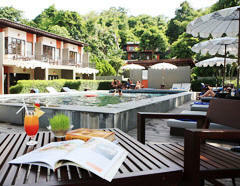 Samed Club is easy to get to and easy to enjoy, with the emphasis on informality, modern design and uncomplicated comfort. A place for the young at heart. • Welcome drink upod arrival. • Shuttle boat (Big Boat) transfer from Seree Ban Phe Pier to Koh Samet. From Seree Ban Phe Pier (Ban Phe, Mainland) : 11.00, 13.30, and 16.00 hrs. From Ao-Klang Pier (Koh Samet) : 10.00, 12.30, and 15.00 hrs. • The rates applicable for World Wide Market. • The special rates applicable for F.I.T. Bookings (Maximum 5 rooms per booking) only. • The above special can not combine with other promotions. • Please mention "Weekday / Weekend Promotion" in your voucher when make the reservation. • Admission Fee to National Park. From Seree Ban Phe Pier – Koh Samet : 11.00, 13.30 and 16.00 hrs. From Koh Samet – Seree Ban Phe Pier : 10.00, 12.30 and 15.00 hrs. • Please mention “SPECIAL RATE MINIMUM 2 NIGHTS” in your voucher when made the booking. • Please mention "SPECIAL WEEKDAY PROMOTION" in your voucher when make the reservation. From Seree Ban Phe Pier (Ban Phe, Mainland) : 11.00, 13.30 and 16.00 hrs. From Ao-Klang Pier (Koh Samet) : 10.00, 12.30 and 15.00 hrs. • The above special cannot combine with other promotions. • Please mention "Hot Deal" in your voucher when make the reservation. • Other terms and conditions as per main rate. • Round trip ground transfer (local taxi) at Ao-Klang Pier from/to Samed Club per person per stay. 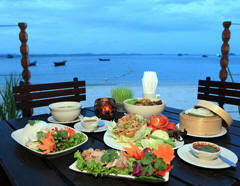 • Peak season surcharge of 1,000 Baht/room/nigh on Chinese New Year: 08-12 Feb 13 and Songkran Holidays 12-16 Apr 13. • Minimum 4 nights stay during 20 Dec 12- 10 Jan 13 is required as well as hotel reserves the right to refuse ther reservation even inside allotment which check out on 31 December. 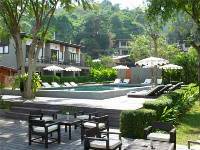 • Minimum 2 nights stay on Thailand Long Weekend. From Seree Ban Phe Pier to Ao-Klang Pier : 11.00, 13,30 and 16.00 hrs. From Ao-Klang Pier to Seree Ban Phe Pier : 10.00, 12,30 and 15.00 hrs. • Note: Transfer (LAND&BOAT) prices are subject to change without prior notice. Any cancellation/amendment must be made in written notice or email to us with our acknowledgement within 30 days prior to arrival date. Failure to do so, we reserve a right to charge the entire amount. No show: total payment is charged.